A testament to saying "there's safety in numbers." This squad boasts high power and speed defense, so use magic or neutral attacks to bring them down! A testament to saying "there's safety in numbers." This squad boasts high speed and magic defense, so use power or neutral attacks to bring them down! A testament to saying "there's safety in numbers." 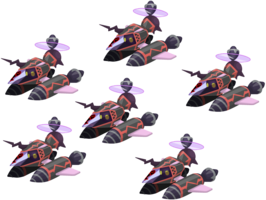 This squad boasts high power and magic defense, so use speed or neutral attacks to bring them down! This mob is literally a handful–of Black Gummi Copters! Keep Dispel on hand and be prepared to remove any attriubte boosts. The Copter Fleet is an Emblem Heartless that is found Kingdom Hearts χ during the Gummi event in 2015. 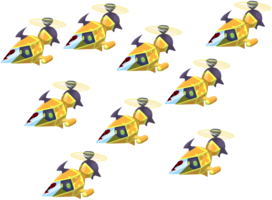 It is a collective of Gummi Copters that comes in four different shades, each dropping Gummi Blocks of their respective color. 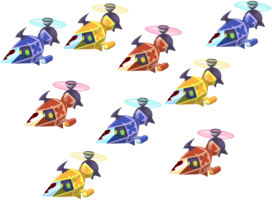 A mixed squad, called the Colorful Copter Fleet, can be found during the June 2016 Dark Corridor Trials. This page was last edited on 2 May 2018, at 14:39.